Many more details are yet to be ironed out. PANAMA CITY — Taking the next step forward with the marina redevelopment, the Panama City Commission will vote Tuesday on whether to continue to work with Sonnenblick Development. 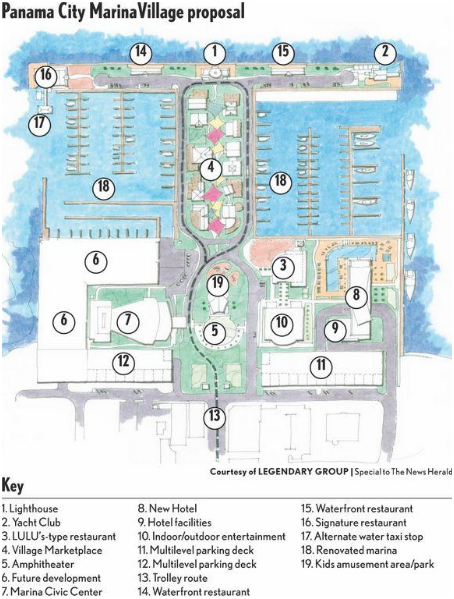 During a 5 p.m. meeting, the commission will publicly go over the proposed plan for the redeveloped marina, called MarinaVillage, for the first time since developer Robert Sonnenblick, the principal of Sonnenblick, presented it in August. The current design, which can be amended as the project moves forward, calls for waterfront dining, boat storage, family-friendly activities and a lighthouse. Approval of that proposal is dependent on what the feasibility studies find. While the whole plan may be talked about, the commission is only voting on whether they want to continue to work with Sonnenblick, and by extension, his partner for this project, developer Peter Bos of Legendary Entity, who has a 20 percent stake. The commission is not voting to approve the designs. A yes vote would give Sonnenblick the go-ahead to start working on feasibility studies and design work. Sonnenblick said he plans to spend several hundred thousand dollars in this next phase. Approval of that proposal also is dependent on what the feasibility studies find. While the majority of commissioners gave the tentative designs a glowing review following the August meeting, Commissioner John Kady has been vocal about his reservations. Kady, for instance, has reservations about the “carnival” atmosphere that a games area in the center of the marina would create, worried it would be inconsistent with Panama City’s branding. He also has concerns about working with Legendary Entity, as the company has a “high risk,” with a low viability rating by financial consultants Dun & Bradstreet as well as ongoing lawsuits. Kady had asked for a workshop prior to Tuesday’s meeting, but there was never “any consensus” among commissioners about having one, according to Brown. The meeting will be at 5 p.m. Tuesday at City Hall, 9 Harrison Ave.